I have always been interested in aviation, aircraft and flying. As part of my apprenticeship with the Ministry of Supply (1954-59), I worked at aircraft servicing at RRE Pershore (1957-58) and RAE Farnborough (1958-59). Was in the Air Cadets for five years and Glider solo at RAF Hawkinge (1957), and a member of the RAE Gliding Club, Farnborough. Gained Private Pilot Licence (PPL) 1971 at Swift Current, Saskatchewan, and on moving to Newfoundland in 1972 continued to fly for a few years and later as an "up-front" passenger. I found myself teaching at the "fly-in" Community of Sandy Lake First Nation, NW Ontario (1955- 2005); one experiences a close up look at passenger flying in and out of small, isolated northern communities. Having a camera readily to hand, lets you take advantage of any opportunities to photograph those older aircraft whose remaining work lives usefully continue in the North. 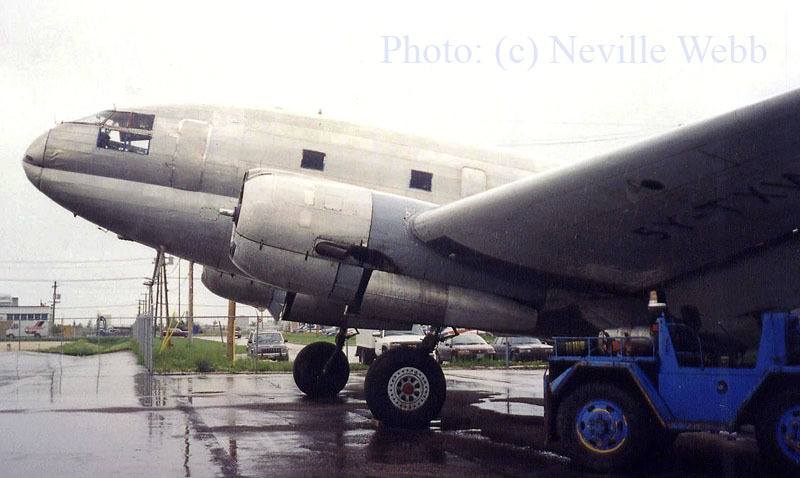 This undentified Curtiss C-46 Commando was photographed by Neville at Winnipeg (maybe June 1998), taken at the Industrial side of Winnipeg Airport (likely the former Air Manitoba hanger). Note the twin pitot tubes under the front fuselage and there seems to be writing on the (outer) front side of port engine cowling. 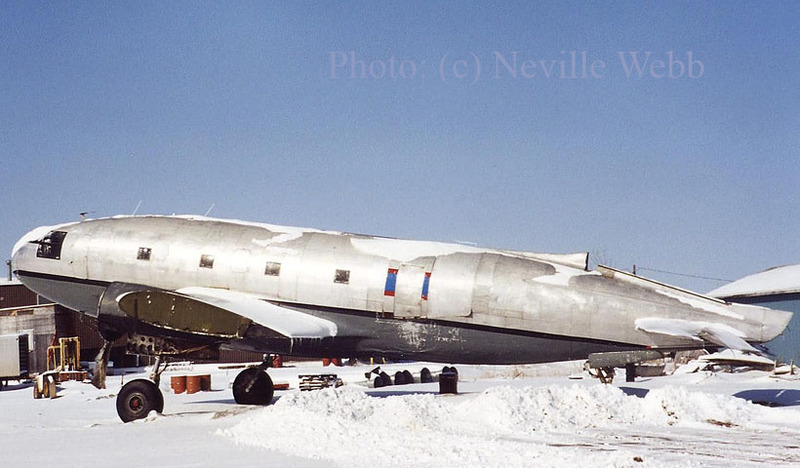 I	have a feeling this could be C-GIBX, C-46F c/n 22472; it was part of Commanda Air Transport, ex/ Air Manitoba. After years of storage it was registered to First Nations Transportation (which is current at time of writing, May 2007). 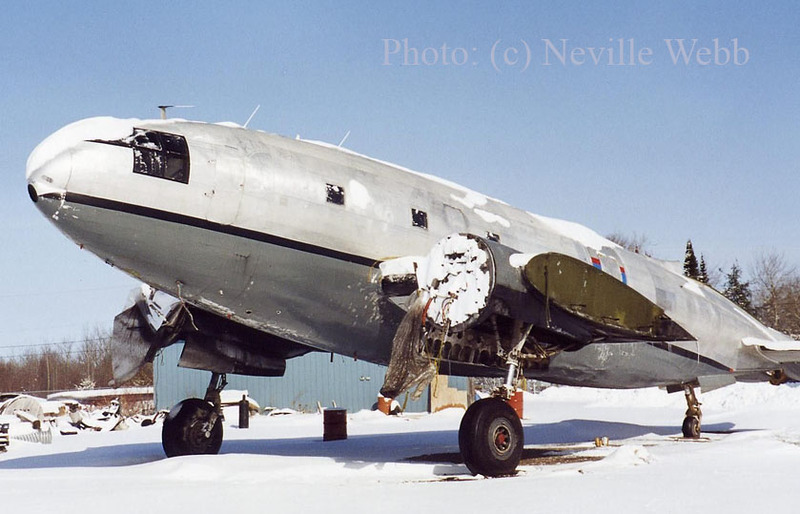 "These C-46 pictures were taken while travelling through Winnipeg and Red Lake, while the photos at Sandy Lake took a little more effort: I heard the C-46 land early one morning and went quickly to the airstrip and lucky enough I found the Curtiss Commano still there after unloading fuel cargo." 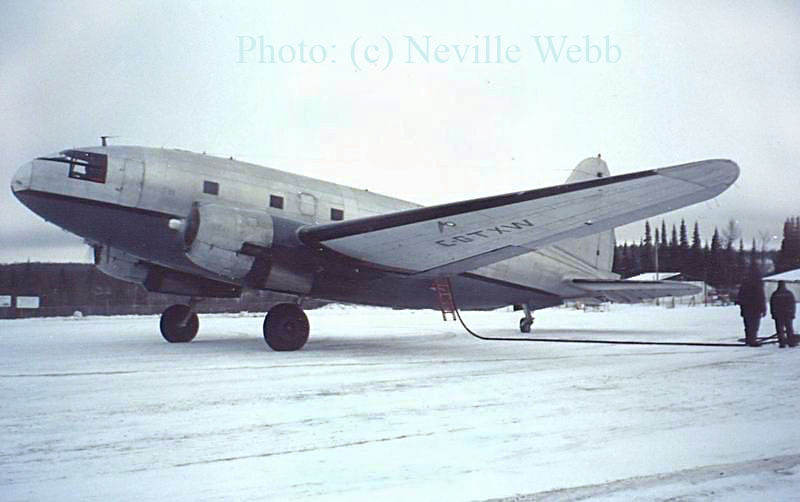 Curtiss C-46A Commando C-GTXW (c/n 30386) is seen here on a fuel-hauling flight at Sandy Lake, northwest Ontario. 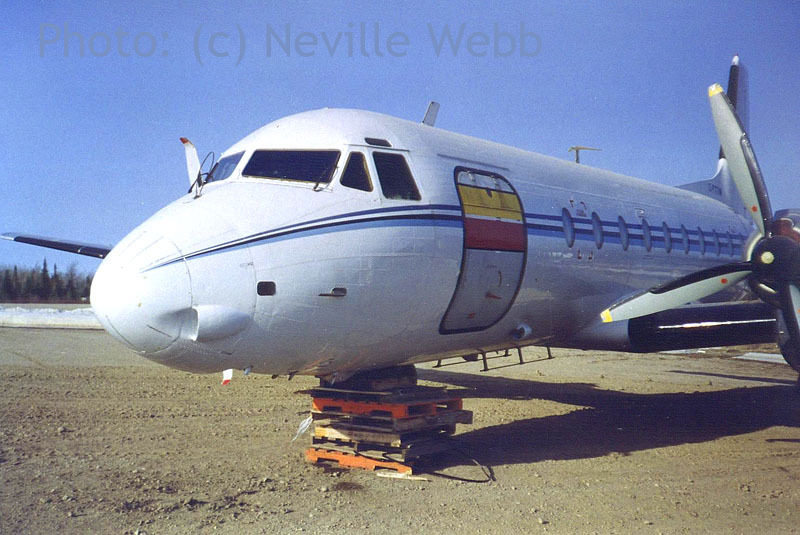 So this photo was taken during its days with Commando Air Transport (registered as such on 23oct96), until it was involved in an accident in the Fall of 2000; CAT's operating license was revoked on 15Mar01, renewed 17Apr01 and suspended again on 23Aug01. C-GTXW was bought by Buffalo Airways of Yellowknife , NWT on 14Nov01 and I saw it at Yellowknife, July 2006 looking very good. 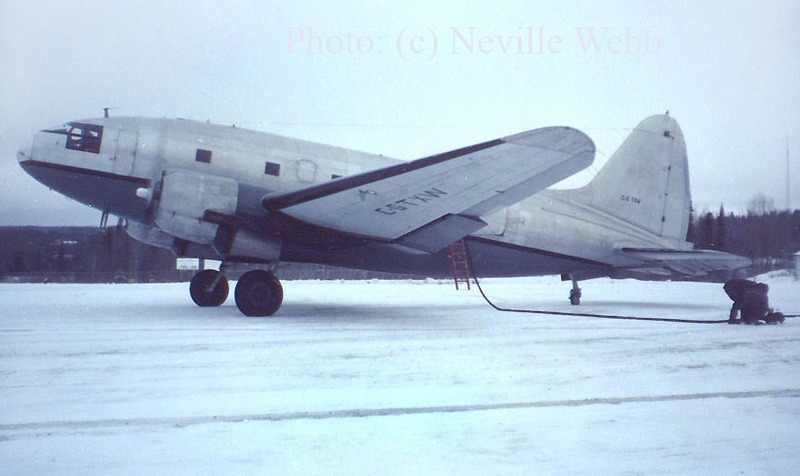 C-46A c/n 30386 was briefly registered 5Y-TXW, as seen here. 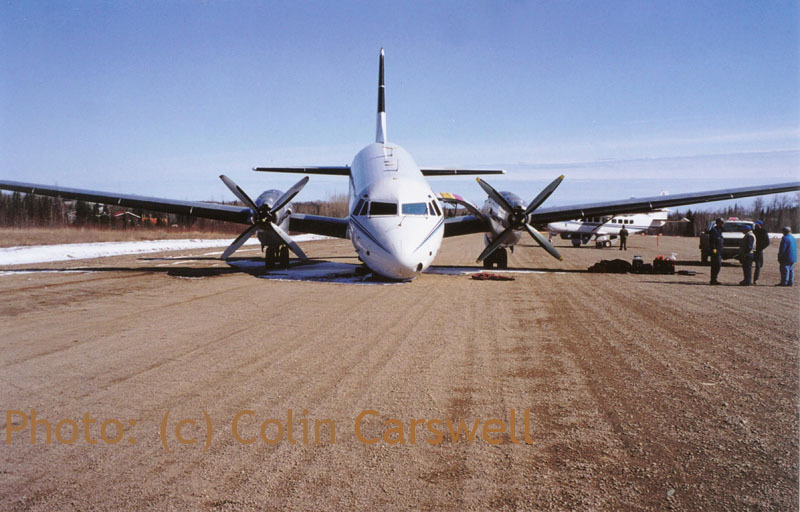 Air Manitoba had put it up for sale and registration C-GTXW was cancelled in August 1994. In 1995 it was reregistered 5Y-TXW for Air Kenya but soon returned to Canada; it was reported at Bar River in April 1996, still registered as 5Y-TXW. On 23Oct96 it was registered to Commando Air Transport. Neville took these photos when it had returned, at Winnipeg. 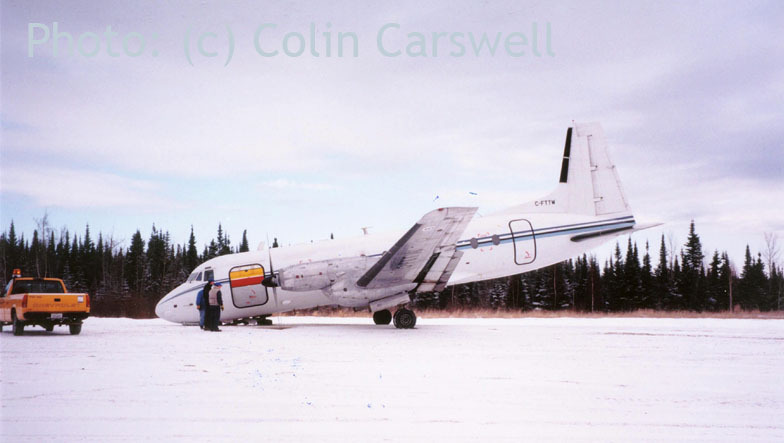 C-GTXW ran out of runway in the Fall of 2001 at Red Lake and was subsequently stored, with the damage. Neville photographed 'X-Ray Whiskey' at Red Lake during Dec.2000 or Jan.2001. The photo below,right is a close up of some of the damage. 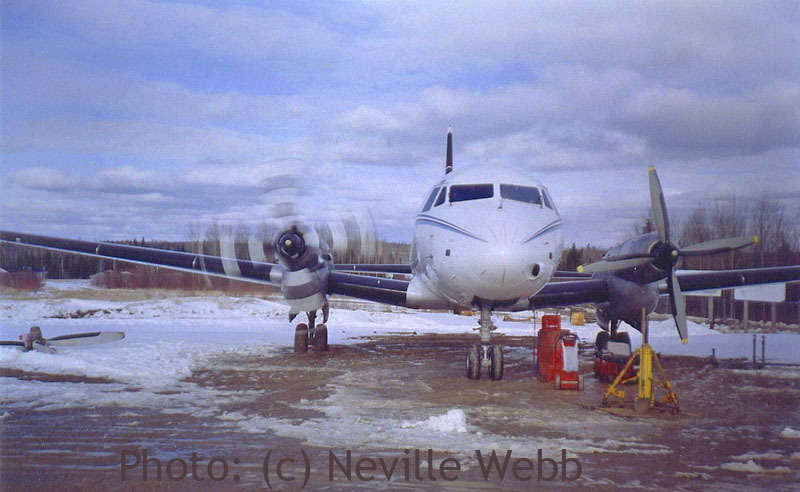 Neville provided the following report on the incident: "On 28 September 2000, Commando Air Transport C-46A C-GTXW aborted a takeoff from Red Lake Airport, Ontario, Canada, for a planned fuel flight to Sandy Lake due to power loss in one R-2800 engine. The aircraft overran the runway and stopped in a ditch. Substantial damage with no injury to crew of three." Note: The use of part of an cargo door in the old Air Manitoba blue and red colours. 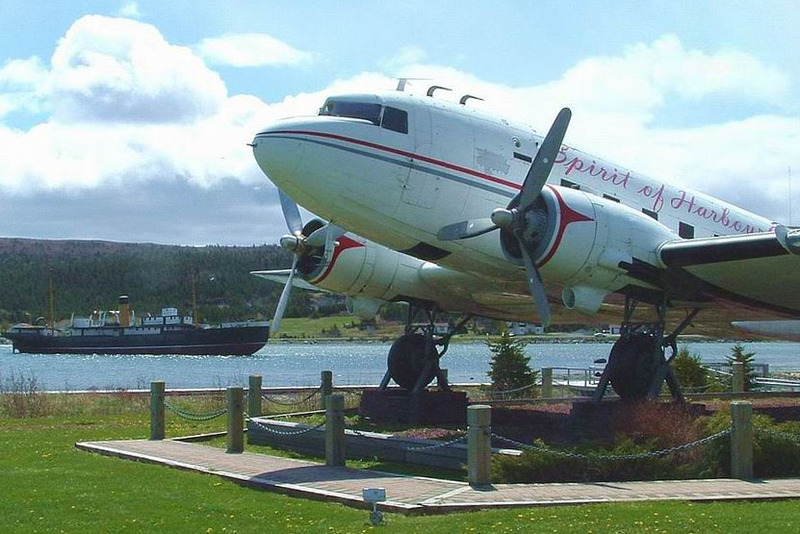 "Newfoundland and Labrador (Gander and Goose Bay) played an important part role wartime aviation (remember Ferry Command's effort in WW2) and post-war propeller aircraft passenger aviation. 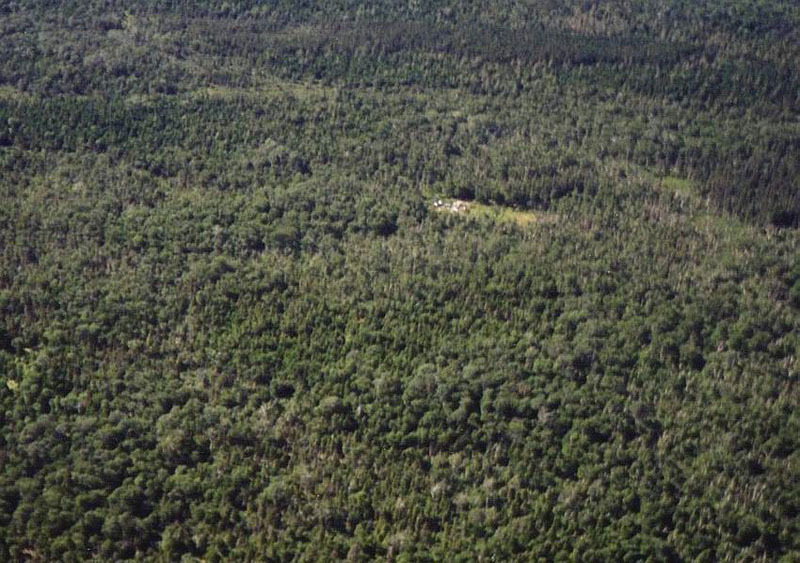 Having a background in working with aircraft allows one to study site remains from archeological and technical perspectives, to identify aircraft components and allow for some description of event happenings." 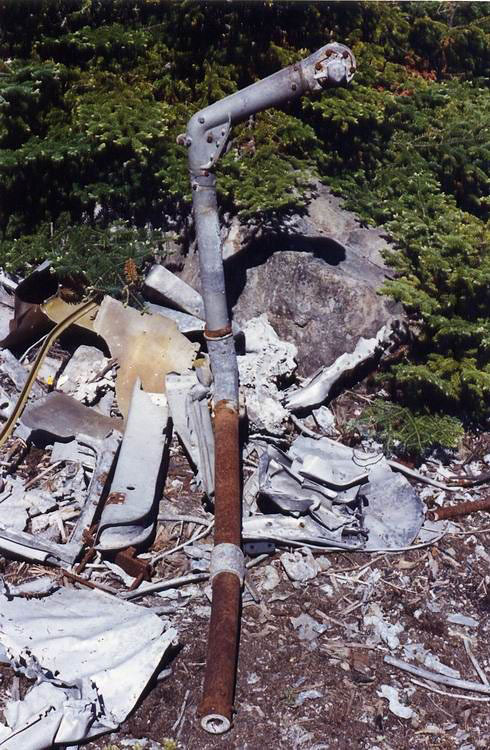 "These are pictures of a USAF C-47 crash site. In past years, I have made three or four visits. 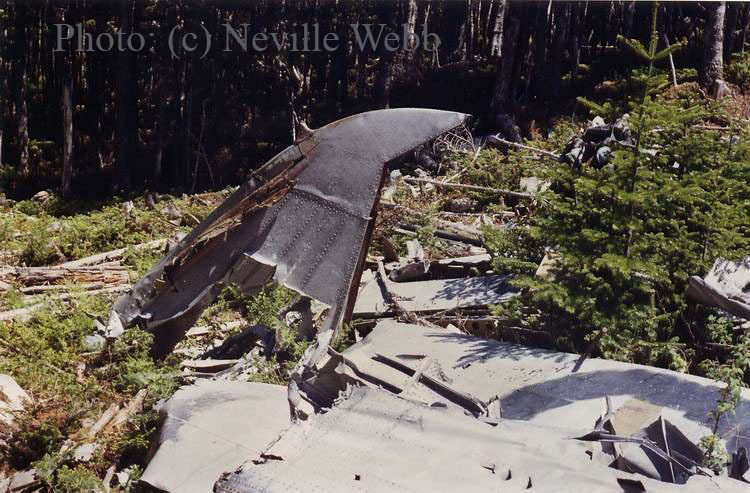 The C-47 was, I believe, on a flight from Goose Bay to Torbay (St. John's airport) with a load of jeep parts and impacted about 3 metres below the top of a hill, at the base of trees: 4 metres higher and/or 20 metres to the left... and tragedy would have been averted!" 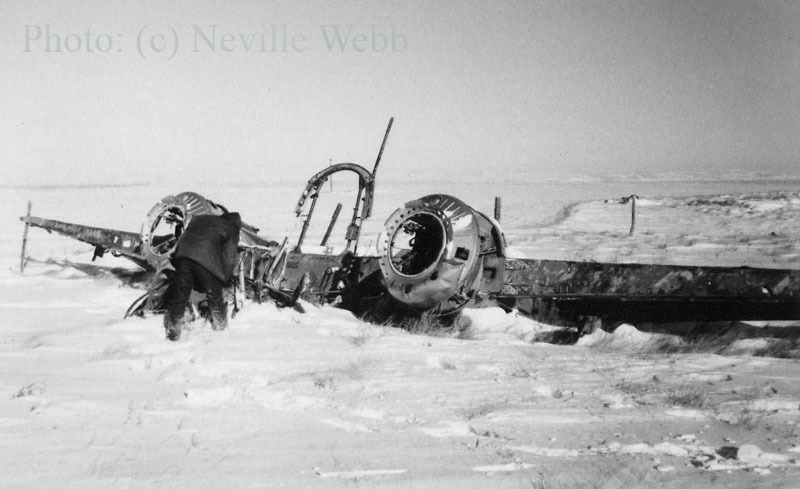 A photo of unidentified aircraft remains on the airfield at Swift Current, Sask in 1970. 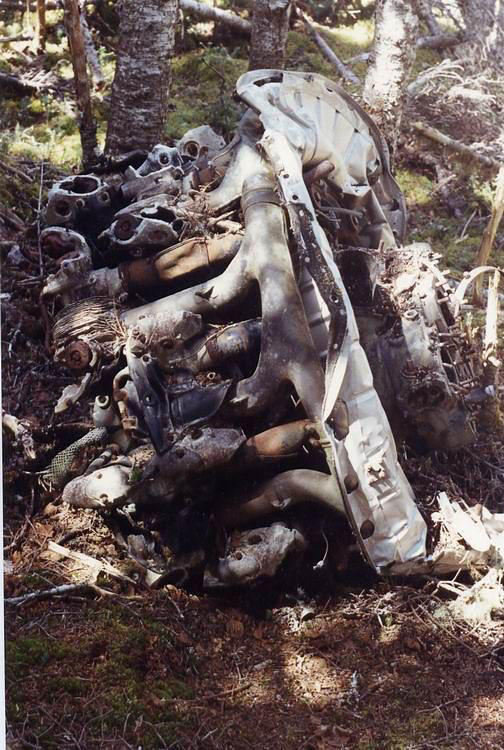 Not much left to identify this wrecked bird..! 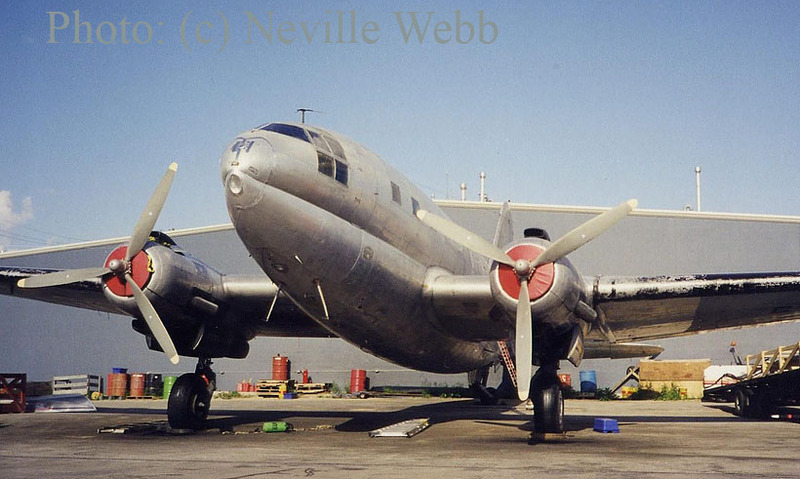 This is Hawker Siddeley (or Avro) 748-264 Series 2A, c/n 1681, tailnumber C-FTTW. Neville wrote: "A series of photos (taken by me) at the freight unloading area at Sandy Lake, NW Ontario. This aircraft had recently had a scheduled overhaul. 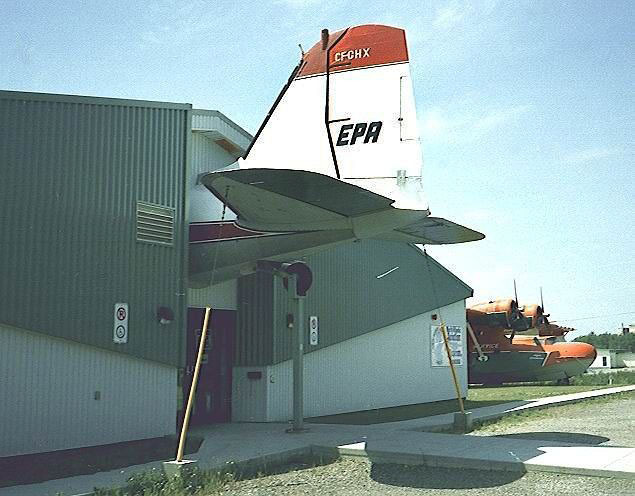 After unloading freight at Sandy Lake, when the pilot was taxying out, he noticed "something funny".. On the runway the nosewheel collapsed ! The nose u/c came out of the upper mount on the oleo leg. The propleller tips dug-in (see pictures) and the aircraft 'spun' around. I believe a front-end-loader was used to lift up the nose, and the aircraft was moved back to the freight apron. Some while later a maintenance crew was flown in, a new nosewheel fitted together with both engines and propeller assemblies. The aircraft was flow out for further repair with the undercarriage extended." "The incident at Sandy Lake took place on 06Apr98. 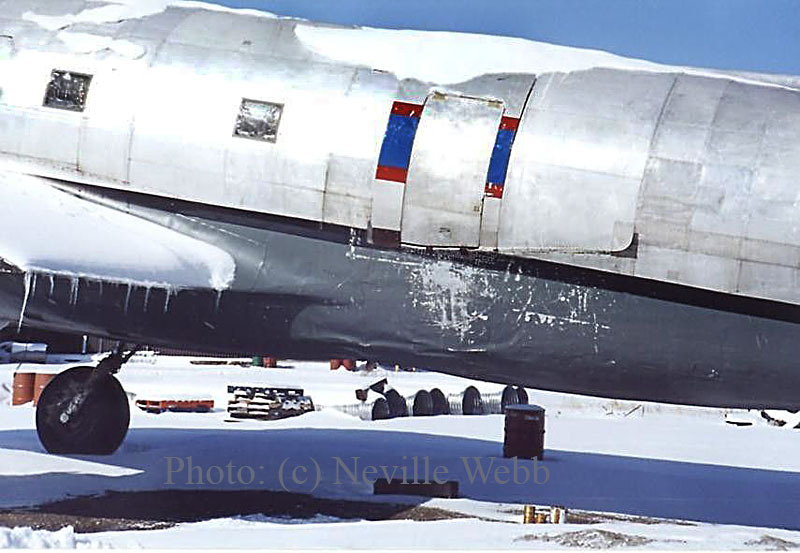 Here are photographs of it sitting on its nose on a snow covered runway. It was raised by a cable attached to the bucket of a bulldozer/snowplough by which time the snow had gone from the runway." 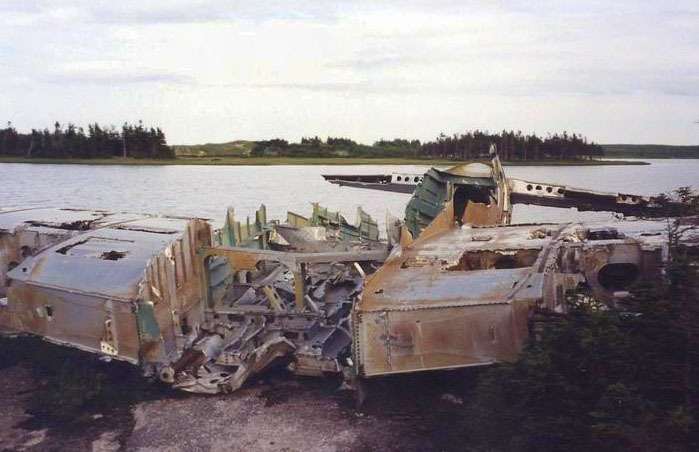 "It was ferried to Winnipeg via Red Lake for repair on 19Apr98. When this had been completed it was ferried to Pickle Lake (on 05Jun98) and was returned to service." Photos by Colin Carswell of Wasaya, Richard Church Collection. A typical "Workhorse of the North" in the freight area at Sandy Lake. This is Air Creebec Cargo HS.748-214 Series 2A C-GMAA (c/n 1576). C-GMAA came from Air Gabon (TR-LQY) and moved on to Wasaya Airways (C-GMAA). DC3 CF-QBI "The Spirit of Harbour Grace"; photos 2007. This aircraft (c/n 6179) was manufactured as a C-47 in 1943 by Douglas Aircraft Company in Santa Monica and served with the USAF in North Africa. At the end of the war the C47 was used as a cargo aircraft by Resort Airlines, then later by Leeward Aeronautical Service and Lake Central Airlines. 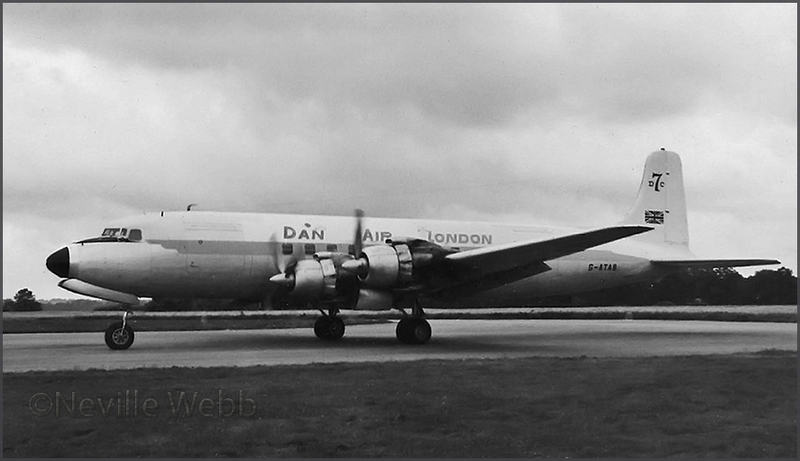 In 1951 the aircraft was bought by a Canadian company and modified to DC3 standard by Douglas. Photos and text by Neville Webb © 2007. 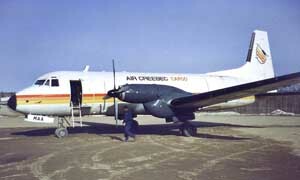 From 1953 until 1977, CF-QBI was flown by Quebec Air. 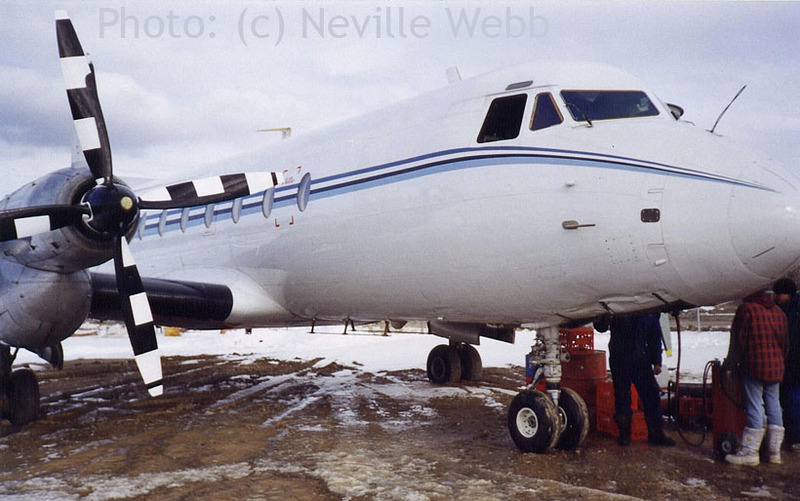 In 1977 Mr. Roger Pike bought the aircraft for use on cargo flights between Stephenville and Goose Bay. 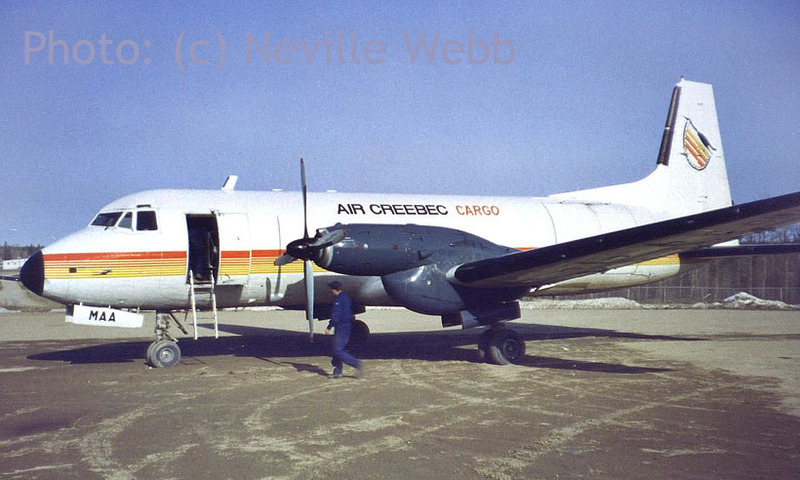 In 1983 Mr. Pike became owner of of Labrador Airways Ltd., and based CF-QBI at Goose Bay for mail and freight flights. 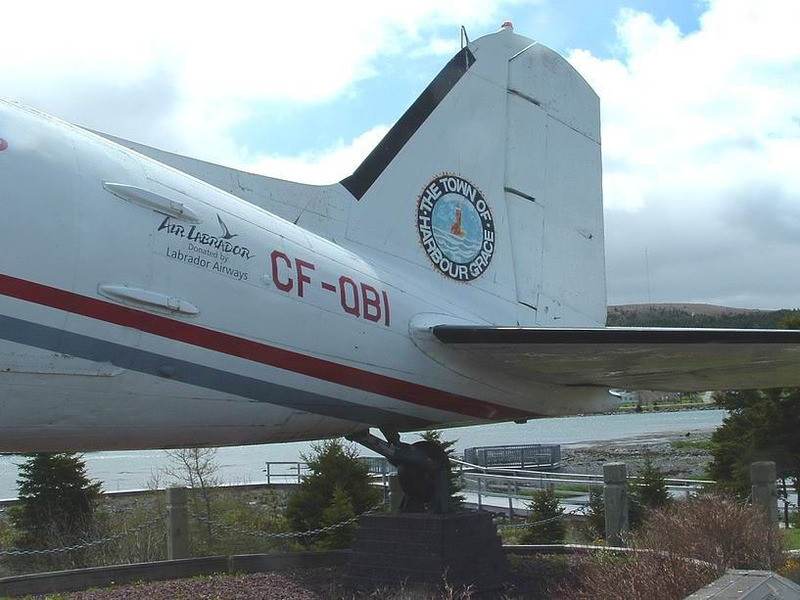 CF-QBI was retired in 1988 and in 1993 the aircraft was presented to the Town of Harbour Grace. The aircraft stands in a small park area adjacent to the road and some eighty metres from the shoreline. 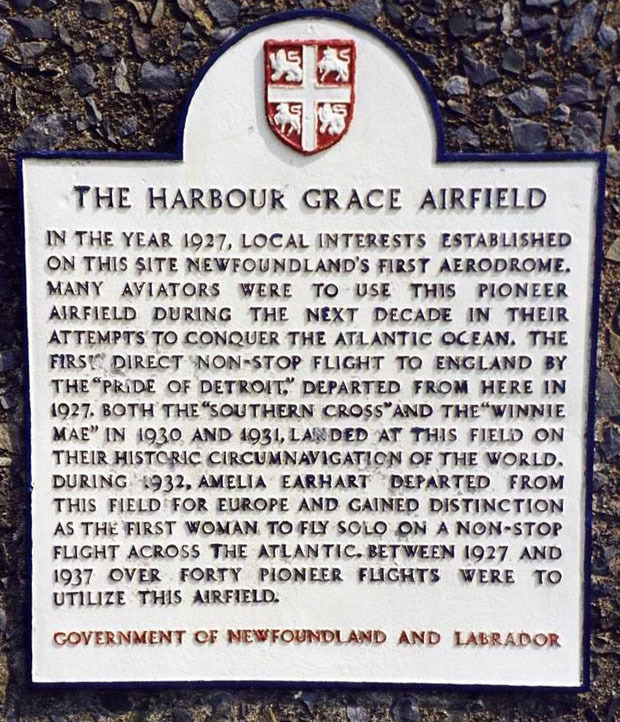 The town of Harbour Grace, Newfoundland, has played an important part in aviation history. 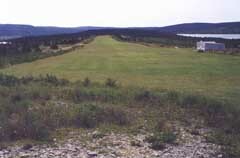 Between 1919 and 1936, the airstrip at Harbour Grace was used by early aviators as a take-off place or as a stop-over for transatlantic flights. A few weeks after the airstrip was completed, on 27Aug1927 the first transatlantic flight from Harbour Grace was made by William S. Brock piloting "The Pride of Detroit." Other famous aviators who have used this famous airstrip include Wiley Post and Harold Gatty, Emelia Earhart, James Mollision, Kingsford Smith, and Capt. Eddie Rickenbacker. Today, standing on this now quiet airstrip one can see white contrails of high flying jets that routinely cross the North Atlantic Ocean each day. A plaque at the airstrip, commemorates those early flights. 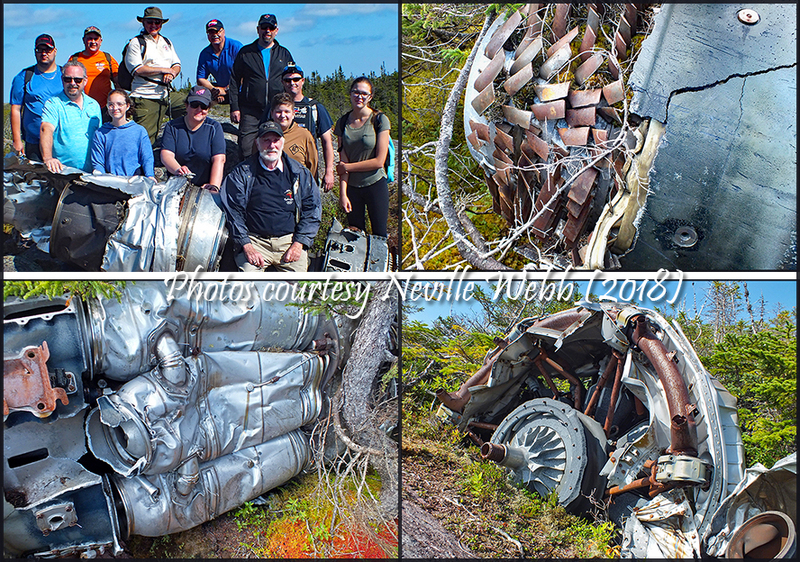 Neville lives nearby a B-36 (51-13721) crashsite, only some 3 hours driving. He has, over the years, invested much time in investigating these remains. The picture is of an exhaust driven supercharger; the turbine blades cut through the thin casing during the crash event .. Improved access (work road) see stuff moved and taken, 'soon' nothing will be left...? B-36's figure in the Virtual Goleta Air and Space Museum: www.air-and-space.com, and on that website you see how Neville laid out what was where & how at the crashsite. Neville wrote me about a 21Sep2018 re-visit. crashsite, the port no. 1 piston engine and one of the paired port GE J47 jet engines." 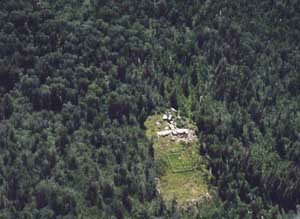 The crash site is at the edge of Gander Lake, almost in-line with runway 22. The 248 soldiers of the 3d Battalion, 502d Infantry, 101st Airborne Division and eight crew members were travelling from Sinai back to the U.S. for the X-mas holidays. 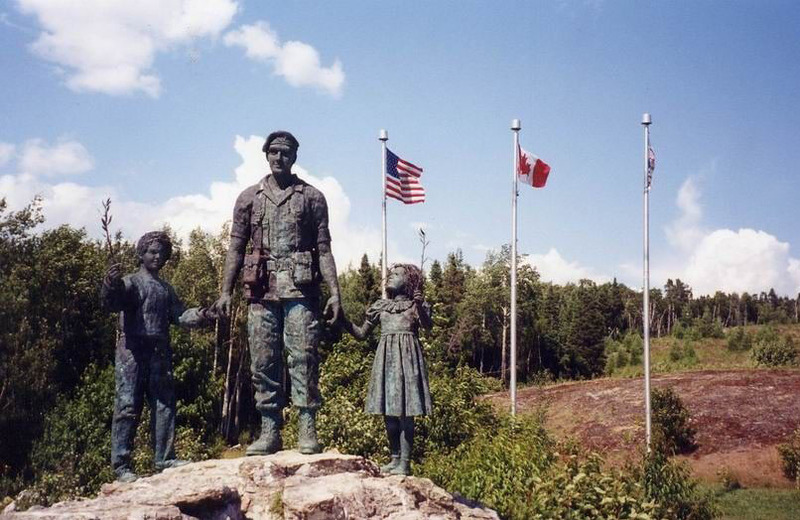 Turning off the Trans-Canada Highway, vistors can make a short drive to the edge of Gander Lake, to visit the Memorial. Photos taken around 1997 or 1998. 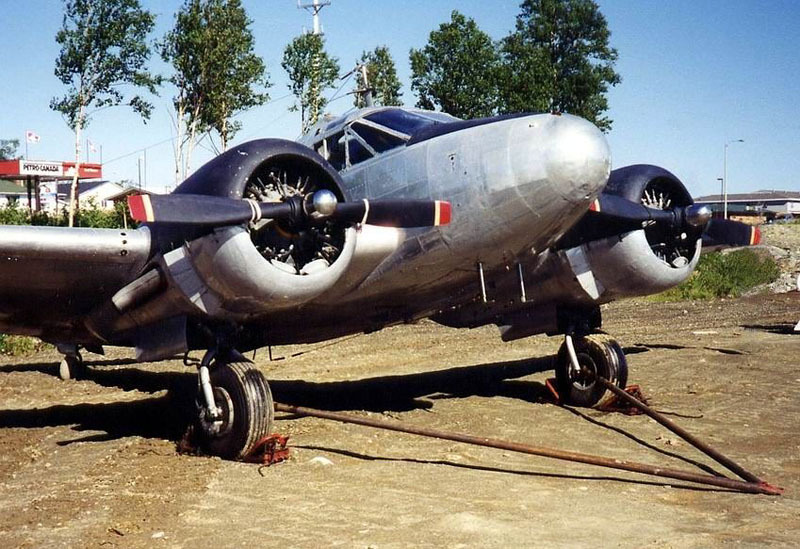 Gander's aviation history goes back to 1937 when construction began on what would be at that time the largest civil airport in the world with four paved runways. On a great circle route, Gander was ideally placed for trans-Atlantic flights. 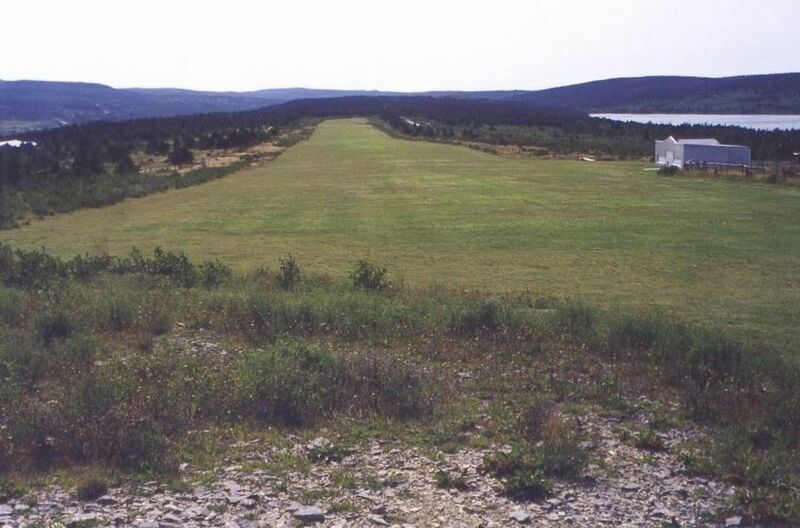 As the only operating airport in Atlantic and Maritime regions at the outbreak of war, Gander was strategically located as a staging base for the stream of military aircraft bound for Europe. 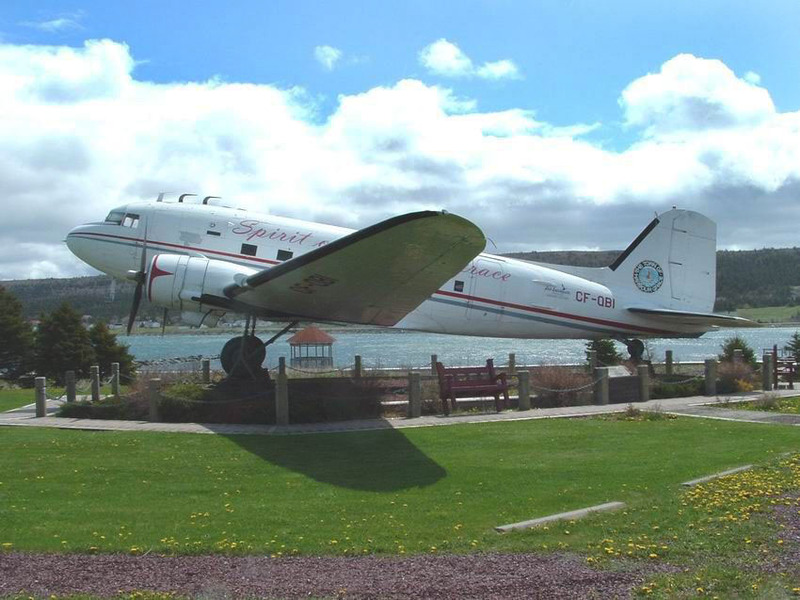 In 1942 the Government of Newfoundland turned over the operation of the airport to the Government of Canada through the RCAF. At war's end, Gander became the "Crossroads of the World" for transoceanic flights. However, the advent of the "jet age" adversely impacted air traffic, as jet aircraft now had the range to directly cross the Atlantic. During the 1980's carriers from Eastern Europe used the airport as a stopover on flights to the Americas such as Havana. 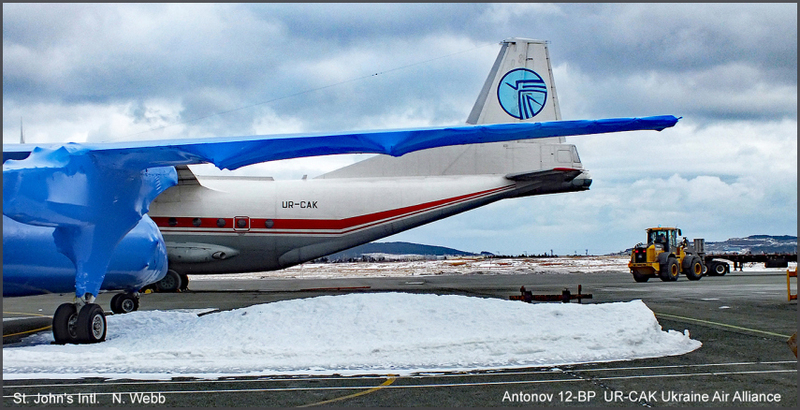 Today, Gander is used by heavy cargo carriers, corporate and private jets. and opened its new building on March 1996. Displays inside include a DH Tiger Moth, engines, aviation artefacts and memorabilia, including photographs and archives related to North Atlantic aviation and Gander in particular. 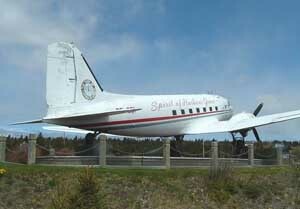 The tail section of this DC-3 is mounted over the main entrance, while the nose section of the aircraft is at the rear of the building. Visitors can enter the cockpit from inside the museum. The aircraft has Eastern Provincial Airlines markings (EPA). From 'Flying the Frontiers Vol.III' by Shirlee Smith Matheson (subtitled 'Aviation Adventures Around the World'), the chapter 'The Merger of the Masters' has a quote by Chuck MacLaren (volunteer at Edmonton's Alberta Aviation Museum) when asked what his favourite aircraft he'd even been working on as a mecanic, was: CF-GHX. "When I worked for Gunnar Nesbitt Aviation we changed 30 engines - all full time with 1.100 hours on each of them - on one DC-3", MacLaren says. That was CF-GHX. 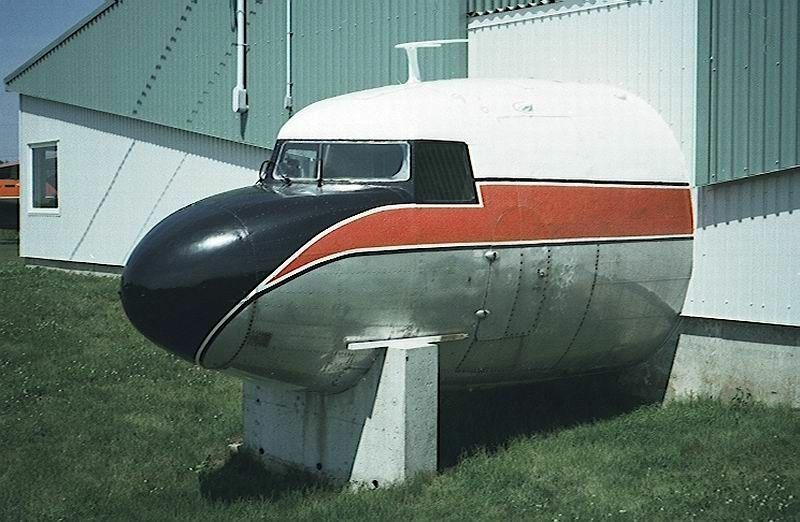 It flew from Edmonton to Uranium City, 365 trips a year. for 10 years!". MacLaren reflects on adventures with the famous DC-3. "We used to land on the ice on Lake Athabasca where Gunnar Mines was, until we got the runway built. On the last landing of the season, the 24th of May, one wheel went through the ice and it ended up on its wing, putting a three inch bend in the wing... We called for help. With the aid of 50 guys from the mine we picked it up and rolled it about 10 feet onto some planks on good ice. Then the pilots flew it home, with the bend in the wing and everything. The big gradual bend didn't seem to bother it any. It flew pretty straight. Our job when we got home was to reskin the top of the wing because the pressure had made little winkels between the rivets." 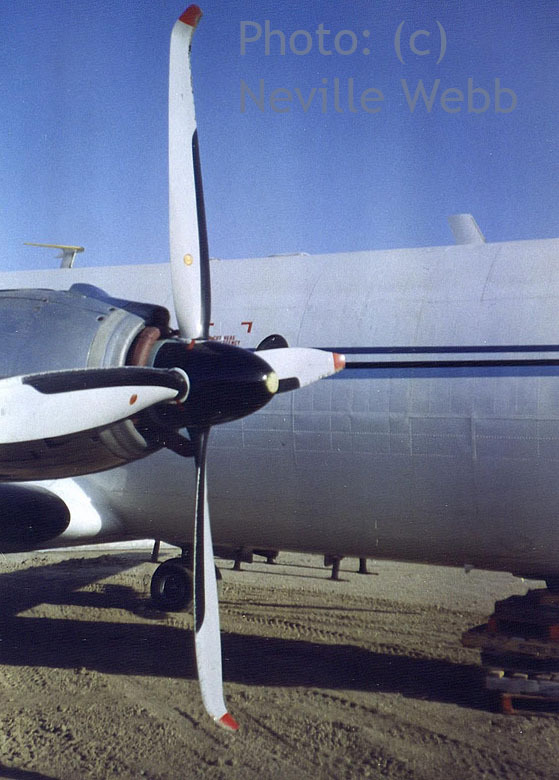 This aircraft was manufactured by Consolidated Aircraft Company at San Diego, California and is powered by two Pratt and Whitney R-1830-92 engines. 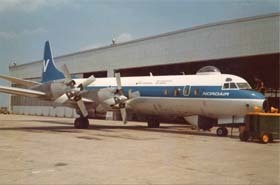 This Canso was with Eastern Provincial Airways in Gander in 1958. 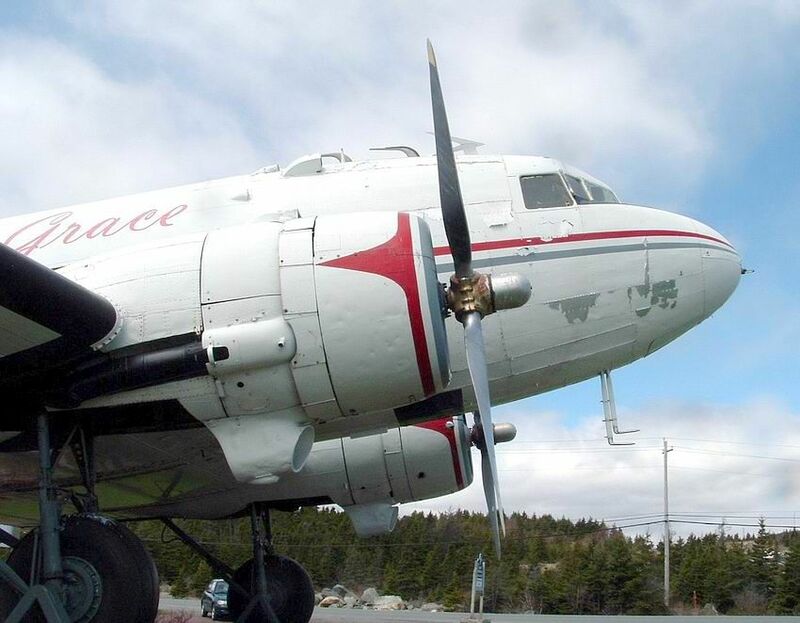 In 1970 the aircraft was sold to the provincial government of Newfoundland Government and Labrador and served as a waterbomber for some twenty years! When replaced by the CL-215, this aircraft was donated to the Museum. Another photo of C-FCRP can be seen further down this page. This aircraft was manufactured by the Beech Aircraft Corporation at Wichita, Kansas. It is on loan from the Gander Campus of College of the North Atlantic. The c/n is A-710 (or CA-110, there seems to be 2 systems) and decorated with a false registration, C-FVPK. Source: OldProps. This aircraft was displayed on a pedestal for many years, near the airport. During World War II, the Hudson was the first of thousands of aircraft to stage through Gander en route to Europe. On November 1940, the first ferry flight was made across the Atlantic of seven Hudson bombers, led by Captain D.C.T Bennett. 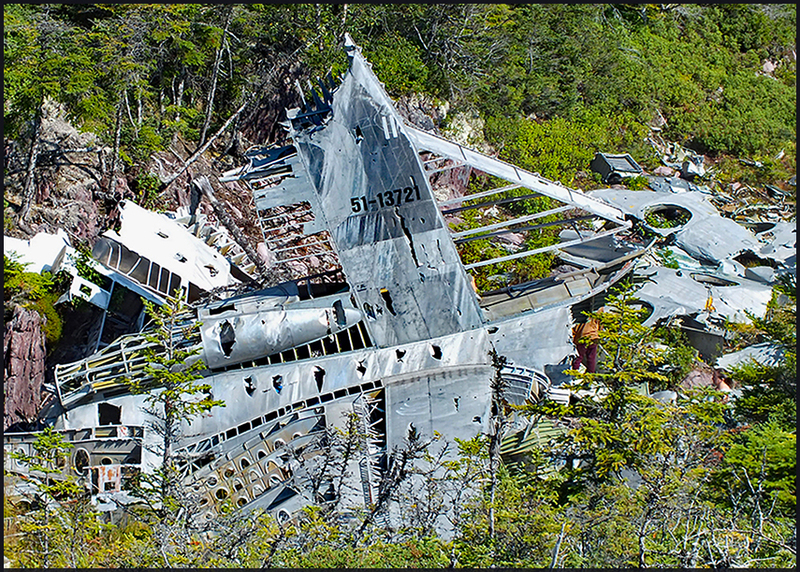 In 1991 the 'Banting Interpretation Center' was built following the airlifting in 1990 of the remains of Hudson T9449 from Seven Mile Pond (Banting Pond) to Banting Park, Musgrave Harbour, Newfoundland. Photos taken in 1997 or 1998. On Friday the 21st of February 1941 Sir Frederick Banting, the co-discoverer of Insulin, died following the crash of Hudson T9449. If you look carefully at the rear fuselage, it seems somebody has chopped out the large RAF roundel with an axe. Mackey waited until he was sure T9449 was over land, then ordered the crew of navigator Flying Officer William Bird, the radio operator William Snailham, and passenger Banting to bail out. Descending in darkness, pilot Mackey glided T9449 down to onto the edge of a frozen lake, hitting a tree with the port wing. Regaining consciousness, Mackey found that none of the others had bailed out! Snailham and Bird were killed in the crash. Banting had serious injuries and died the following day. Mackey was not found until the following Monday by a searching aircraft. SABENA DC4-1009, OO-CBG (c/n 42986). 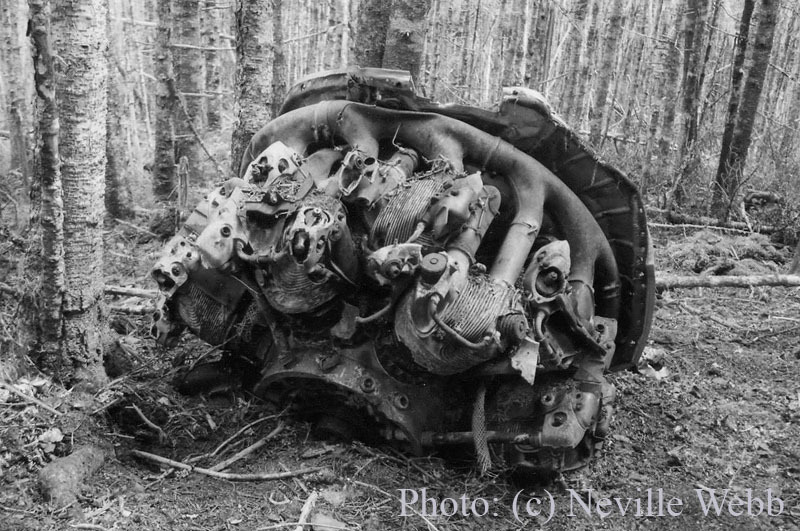 On 18th September 1946, on a flight from Brussels to New York, OO-CBG crashed while descending through low cloud into a densely wooded area (600 feet ASL ) 22 miles SW of Gander (500 feet ASL). 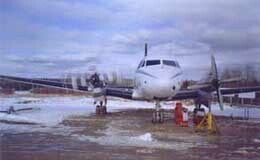 The aircraft was due to land at Gander for a refuelling stop. At that time it was the world's worst aviation accident with 21 of 37 passengers (and 6 of 7 crew) killed. The accident is notable for the help given to the survivors by two local trappers, who were first at the scene, the efforts made by rescuers to get the survivors out, and the first (important) use of two helicopters to rescue survivors. It was concluded that the pilot in command was carrying out an inappropriate approach with respect to the weather, neglected the strong NNE wind, and likely did not know the aircraft's position relative to the airport. The command pilot requested QFE (height above ground) which was given by the controller as 29.88. 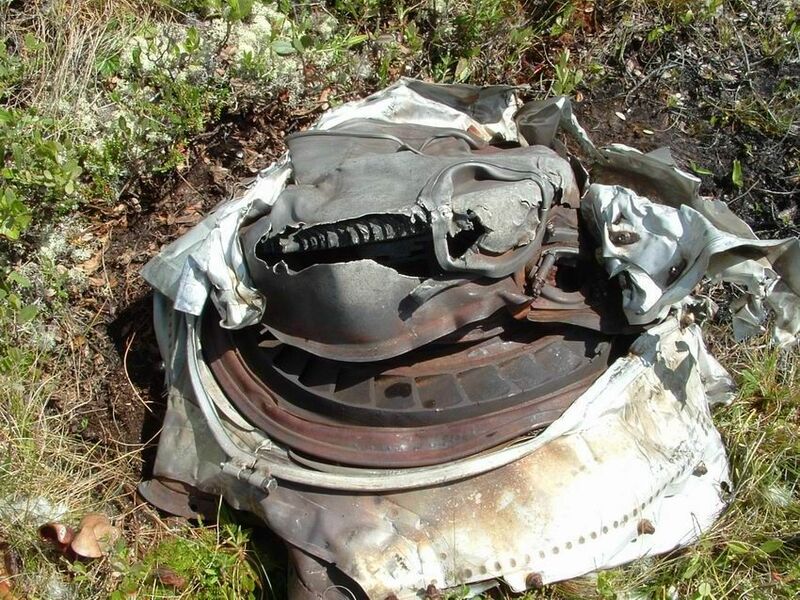 At the crash site, the pilot's and navigator's altimeters were found set respectively to 29.40 and 29.90. Another possible contributing cause was a misunderstanding between the pilots of the aircraft's height above ground and actual ASL. Following the crash, a gravesite was established at the site of the crash. The gravesite is called St. Martin in the Woods. Report on Aviation Safety Network (ASN). In Dec.2009 Neville sent another batch of photos to add on this webpage. 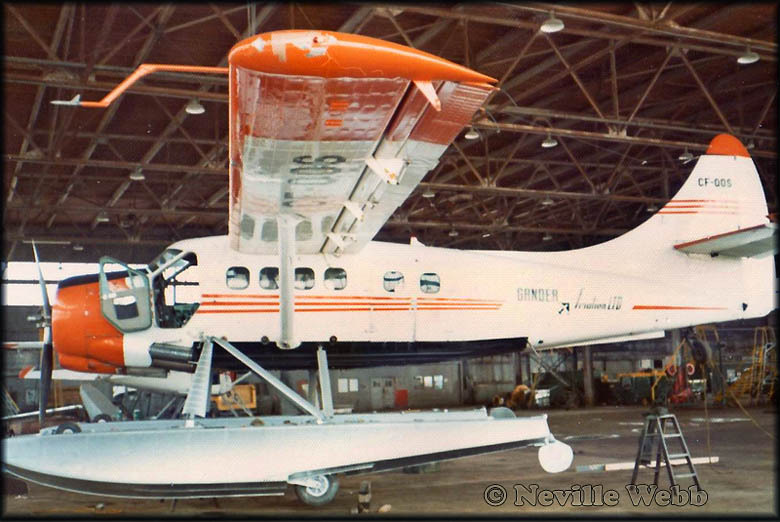 To start with: deHavilland DHC-3 otter CF-QOS (c/n 398) of Gander Aviation. Neville thought he'd taken this photo in 1973, at St.John's. 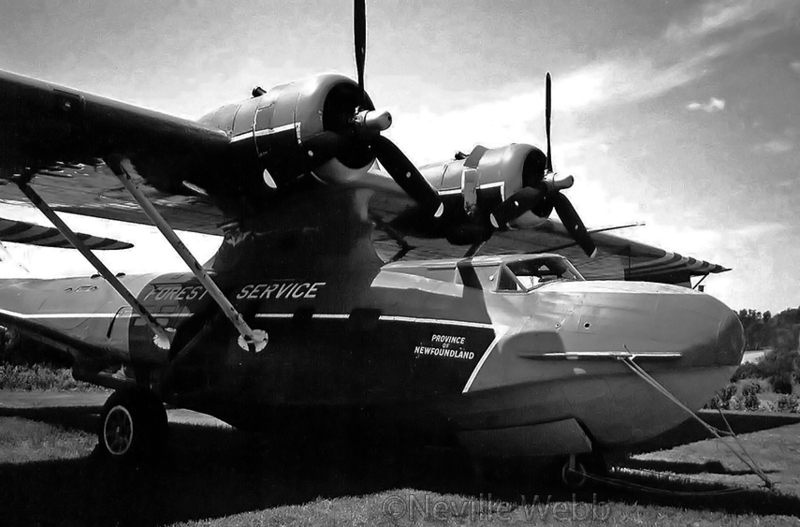 DHC-3 Otter c/n 398 was delivered to the RCAF on 31Oct1960 with serial 9418. It was allocated to 418 Squadron, Namao. It sustained 'B' category damage on 14Sep1961 in the course of a training flight. On landing back at base at Namao, the student levelled off too high and stalled in. The heavy landing badly damaged the landing gear. The Otter was trucked to the Canadian Pacific Airlines depot at Lincoln Park, Calgary for repair, where it arrived on 29Sep1961. After repair it was re-issued to 418 Squadron, Namao on 11Jan62. During 1963 it was involved in two SAR missions, in February '63 for Howard DGA N58856 and in September '63 for Cessna 175 CF-LBF. On both of these missions it 501 flew alongside 418 Squadron Otter 9417 (396). It continued flying for 418 Squadron until it met with another 'B' category crash on the airbase at Namao on 15Oct67. 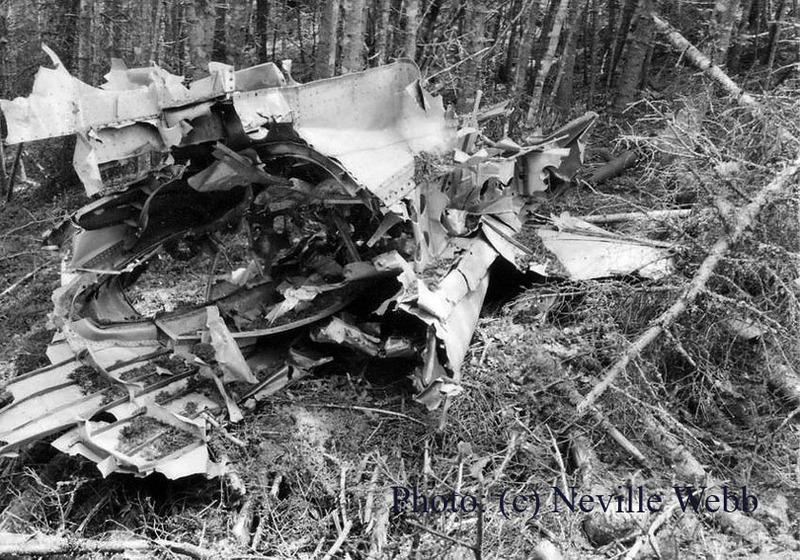 That accident ended its RCAF career, during which it had flown 2,127 hours. 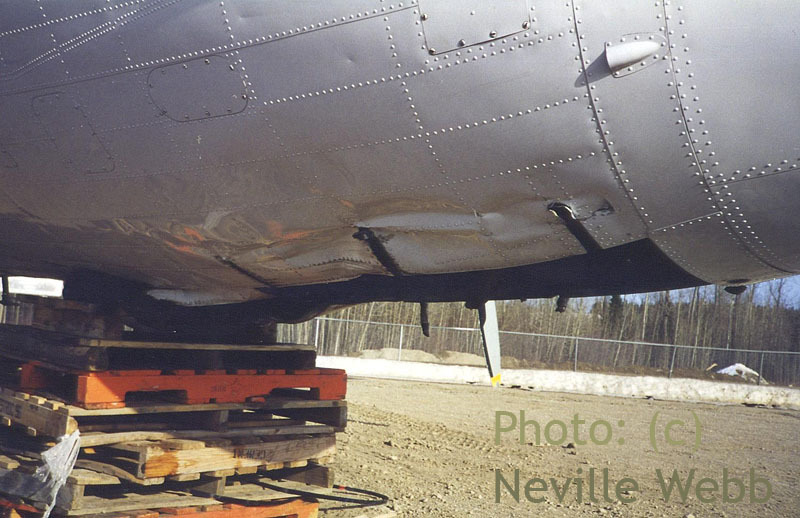 The damaged Otter was put into storage at Namao and in Sep68 was moved to the Mountain View depot in Ontario and put up for disposal, in its damaged condition, through the Crown Assets Disposal Corporation. 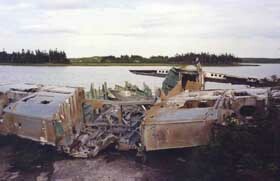 It was one of three damaged Otters sold on 08Feb71 to Gander Aviation Ltd of Gander, Newfoundland. 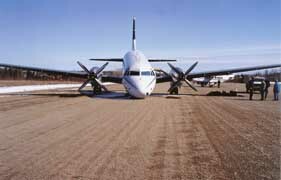 The 3 aircraft were trucked from Mountain View to Weston Aircraft Ltd, Oshawa, Ontario where they were rebuilt for Gander Aviation. On 13May71, as the rebuilds were in progress, marks were allocated for the three Otters, CF-QOQ (46) ex 3685, CF-QOR (375) ex 9409 and CF-QOS (398) ex 9418. Two of the aircraft, QOQ and QOR, were sold on but QOS was registered to Gander Aviation Ltd in June 1971, intended for operation by the company. 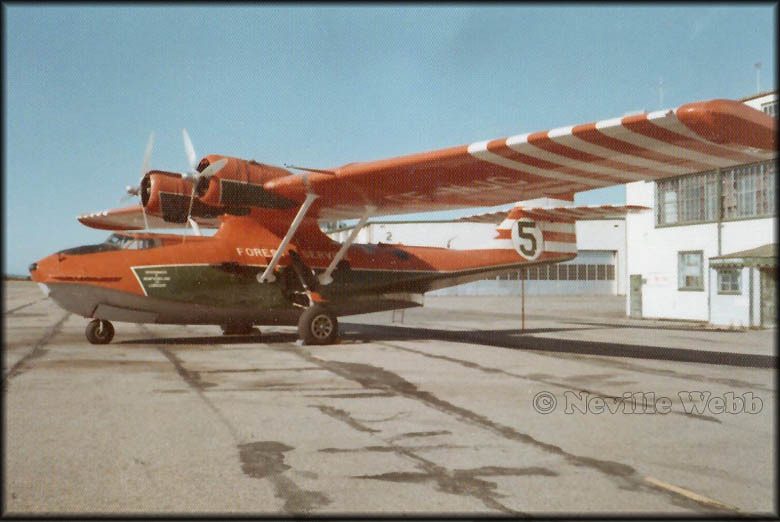 On 03Jul71 William Bennett, the owner of Gander Aviation, performed a test flight at Oshawa in QOS, and on 06Jul71 he flew the Otter to Carp, Ontario where Bristol amphibious floats were fitted. On 08Jul71 he set off on the Otter's delivery flight, routing that day from Carp to Fredericton, New Brunswick and the following day via Charlottetown to Gander, CF-QOS then entered service with Gander Aviation Ltd. The Otter was used for general charter work around both the island of Newfoundland and in mainland Labrador. It also supported outpost fishing camps in Labrador, at Michael River and Sand Hill River. 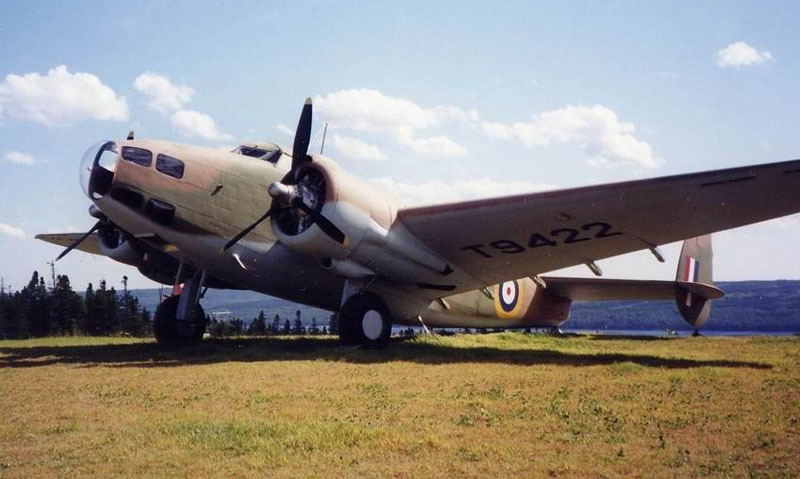 It was used to fly freight and personnel to Baie d'Espoire, Newfoundland where a power station was being built. Another task was to bring patients in from outlying nursing stations to St.Johns. It was on such a flight that QOS crashed on landing at St.Johns on 11Jan72. The Otter was flying under charter to the Department of Health. There were seven souls on board, including two pilots and a medical attendant. Two stretcher patients had been picked up at Burgeo, and two more at Harbour Breton. The Otter landed 300 feet short of runway 29 at the St.Johns IAP, shortly after 5pm that afternoon. The accident report cited as a factor the pilot's lack of familiarity with the aircraft. The Otter came down on rough gravel and was badly damaged, although no one was injured. The ambulances which had been waiting at the airport for the arriving patients drove to the scene and were able to take the patients to hospital. 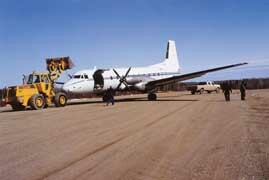 The Otter was shipped to Montreal for repair, after which it returned to Gander and continued in service with Gander Aviation until August 1974. 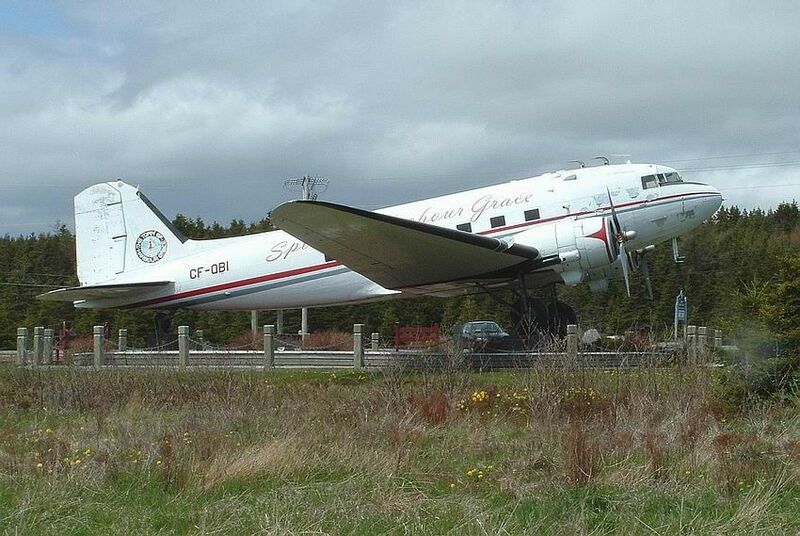 It had flown 1,304 hours while in service with Gander Aviation. It then went to the mainland for structural modifications before being sold to Direquair Inc of Chibougamau, Quebec in 1975, registered C-FQOS. 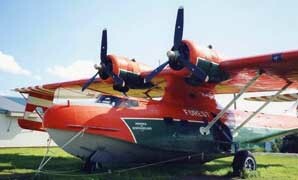 It was based at Lac Cache and served alongside the company's other two Otters C-FDIO (452) and C-FAPQ (201). There was a change of name to Air Mistassini Inc in 1981. The following year, Air Mistassini went bankrupt and the Otters were lying at Lac Cache for a time. QOS was sold to Air Melancon Inc of St.Anne du Lac, Quebec to whom it was registered in August 1983. It was to fly for Air Melancon for many years and in 1992 was converted to a Vazar turbo Otter. 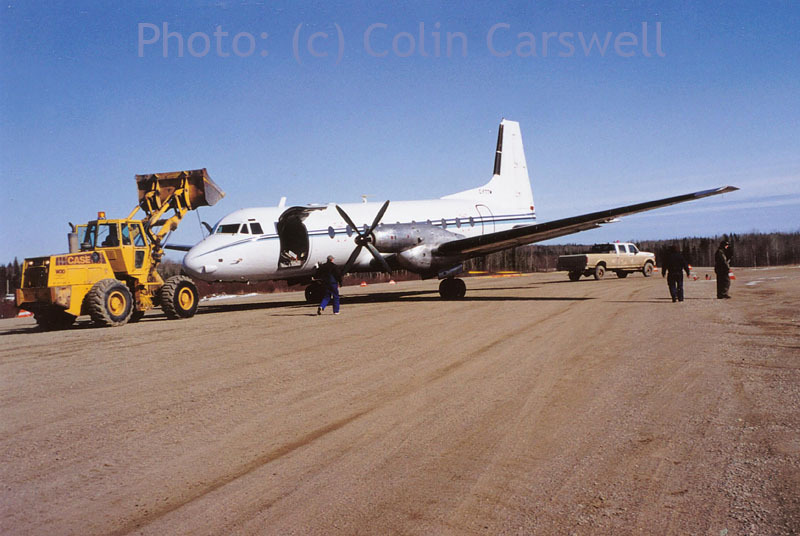 C-FQOS continued in service with Air Melancon until June 1998, when it was sold to Labrador Airways Ltd, trading as Air Labrador and moved to its new base at Goose Bay. The owners of Air Labrador had an associated company called Tamalik Air, used primarily to support hunting and fishing camps, and QOS was assigned to Tamalik Air and painted in its striking red overall colour scheme. 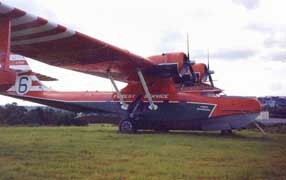 When not flying for Tamalik Air, it flew as part of the Air Labrador fleet. 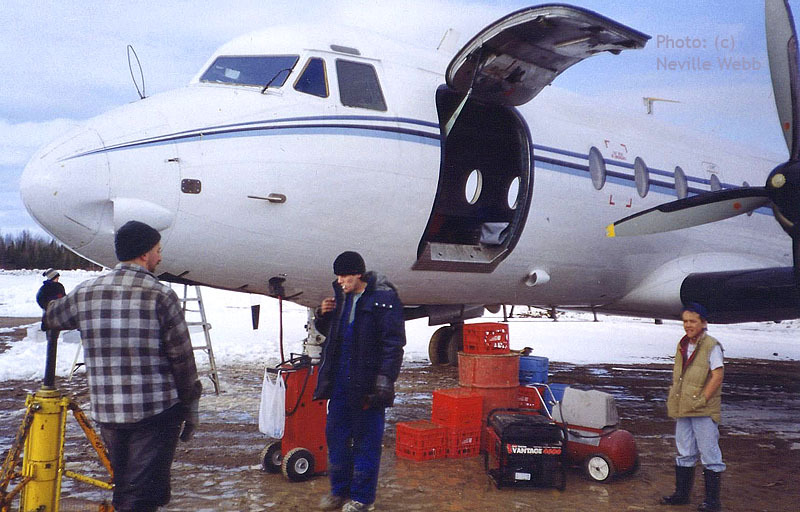 For example, during April 2001 it was heavily tasked flying fuel in barrels and groceries from Goose Bay to Border 502 Beacon as the native Innu were moving there from Davis Inlet. 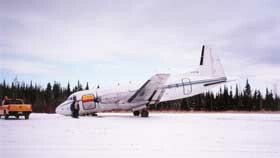 QOS continued flying for Air Labrador/Tamalik Air until an accident on 12Sep2001, which occurred as the Otter was taking off from Otter Creek at Goose Bay en route to a fishing lodge. The pilot reported he was in climb mode when the aircraft pitched forward and then nosed up before entering an uncontrollable nose-down descent, although it did not exhibit characteristics normally associated with an aerodynamic stall. 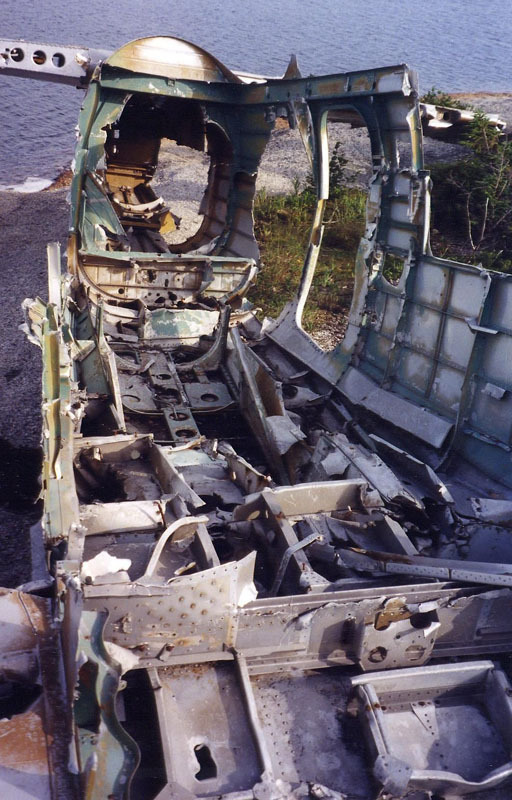 It impacted the water hard, resulting in structural failure of the float supports and extensive damage to the fuselage. “Lab Air 911”, a Twin Otter medevac flight bound for Nain witnessed the incident and raised the alarm. The pilot and three passengers were rescued by boat, but QOS sank in 55 feet of water. It was raised up, and the wreck sold to aircraft dealer Glen W.Ernst of Temecula, California. The Otter somewhat disappeared from view until July 2007 when during a visit to the Kenai Airport in Alaska it was noted in a hangar there under rebuild. By Jan.2010 I could find no reference that the rebuild had been completed or for whom. 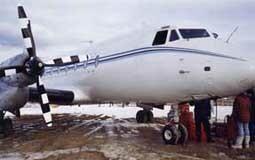 "Seen at Gander: NORDAIR's Lockheed Electra L-188CF assigned to a Canadian Government contract, the socalled ICE PATROL assignment. 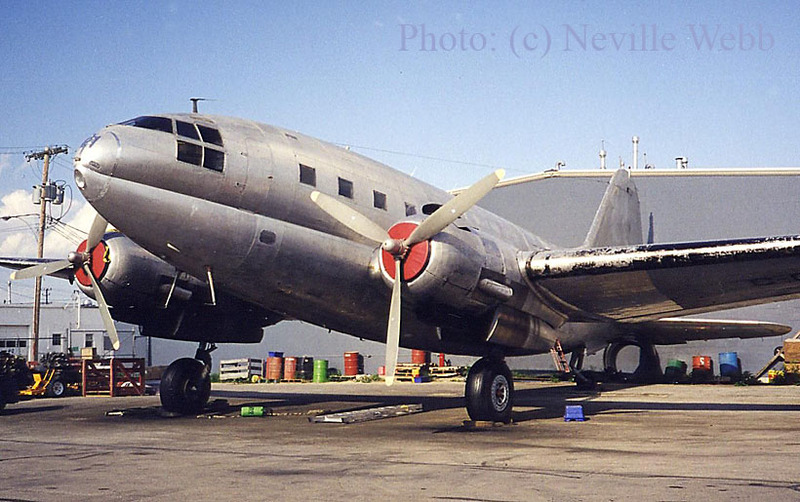 I don't know the registration number of this L.188 Electra." "CF-NAZ was re-registered as C-GNDZ in 1978 when rebuilt following severe damage sustained in an incident with CAF 10737, Argus - Mar 31 '77. Since the newspaper photo supports Ken's statement that it was unlikely that this wreck was rebuilt I investigated further. 9Q-CRY apr92 for New ACS, w/o aug92 dbr. NOTE: no note of repair or rebuilding! 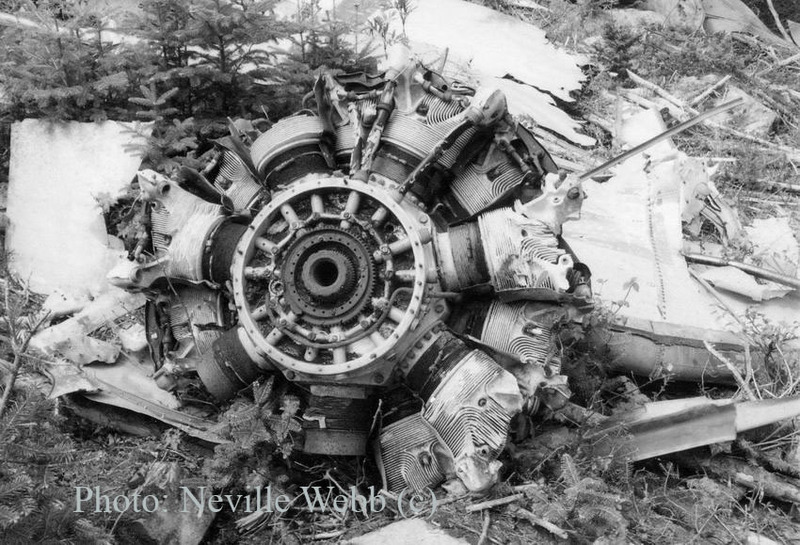 CF-NAZ: Destroyed 31/03/77 at YSU (hit by RCAF CL-28 10737, wreck used to rebuild C-GNDZ c/n 1111). 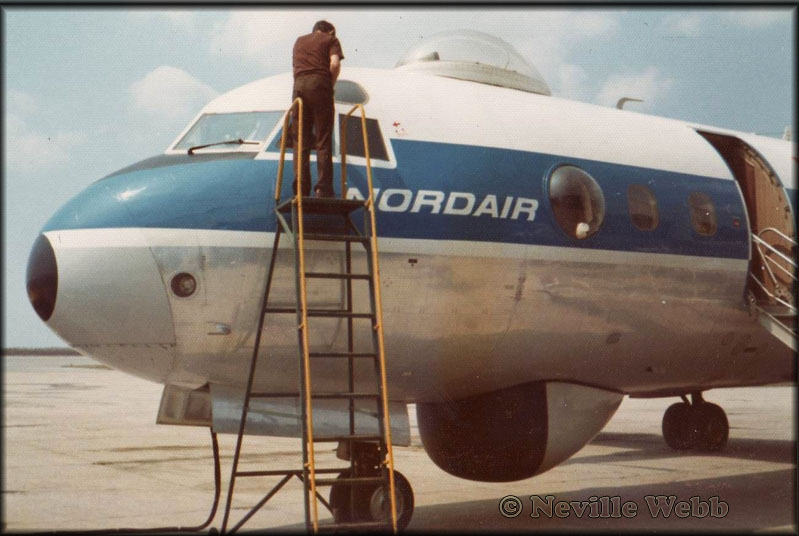 And on C-GNDZ c/n 1111: Nordair ex Air Florida –rebuilt by AJI with front fuselage from CF-NAZ c/n 1132, opf Canadian Dept of Environment/Ice Reconnaissance. 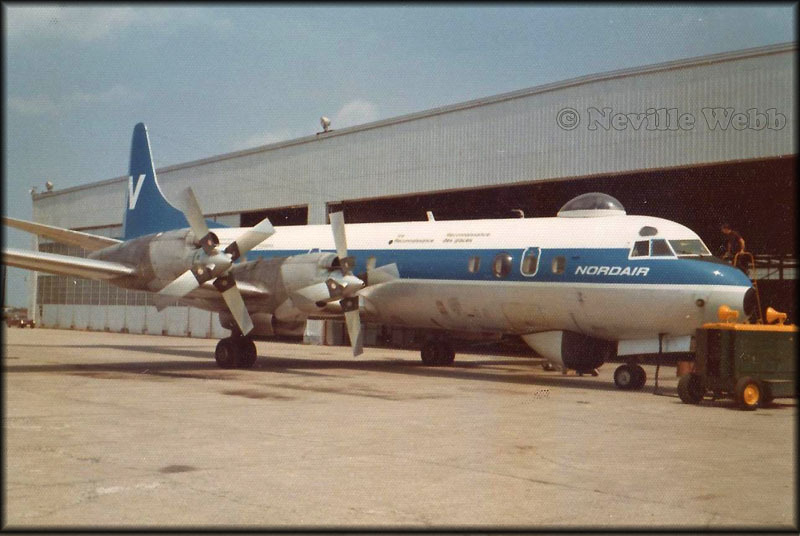 "The DC-4 aircraft were replaced in 1972 by two Lockheed Electra (L-188C) aircraft, CF-NAY and CF-NAZ (renamed C-GNDZ following an accident in 1977). 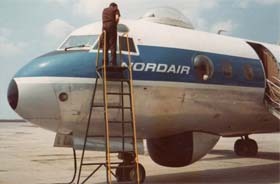 The Electra aircraft were owned and operated by Nordair Limited of Montreal. The first Side-Looking Airborne Radar (SLAR) used for ice reconnaissance was installed on C-GNDZ in 1978." Canso Water Bomber in 1973, of the Newfoundland Forestry Service. Taken at St John's Airport (Industrial Side). Delivered to USAAF as 44-33929. Eastern Provincial Airways, Gander, Newfoundland, 1965. Registered as CF-NJC. 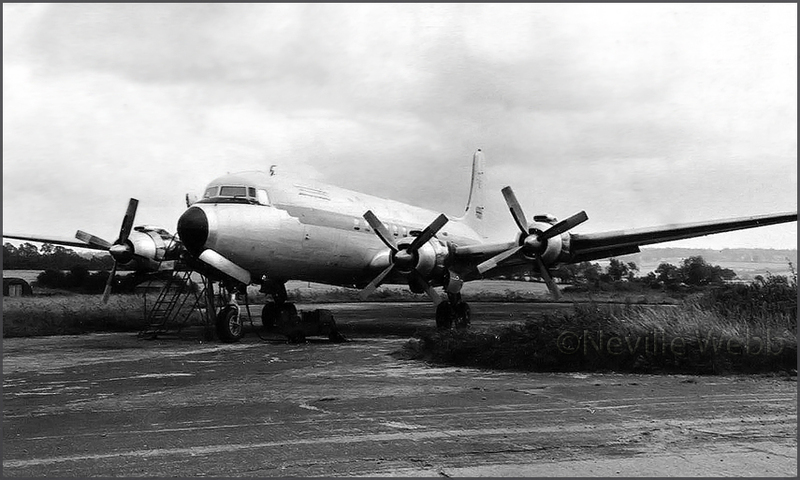 Air Britain Photographic Images Collection has a photo of C-FNJC as tanker#701. 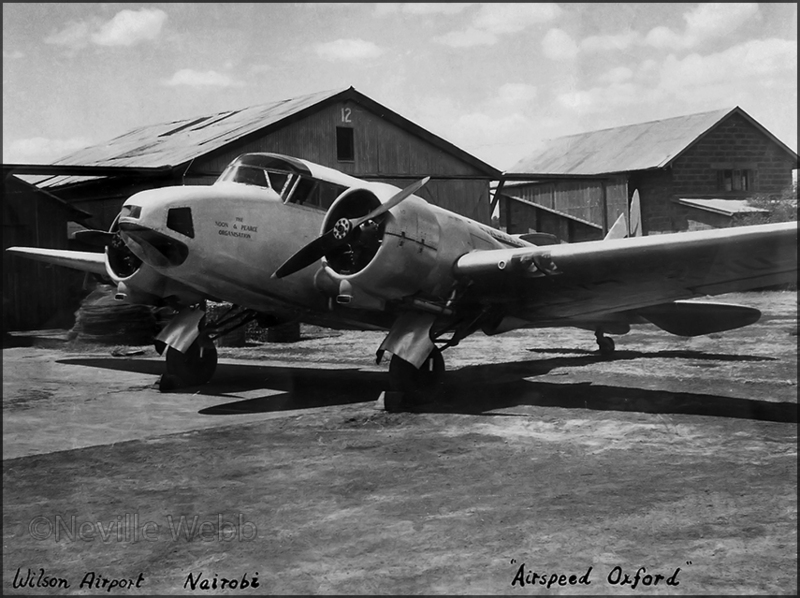 Neville took this picture at Nairobi´s Wilson Airport, approx 1961.
amount of aircraft were converted from military AS.10 (post WW2) to civil use. 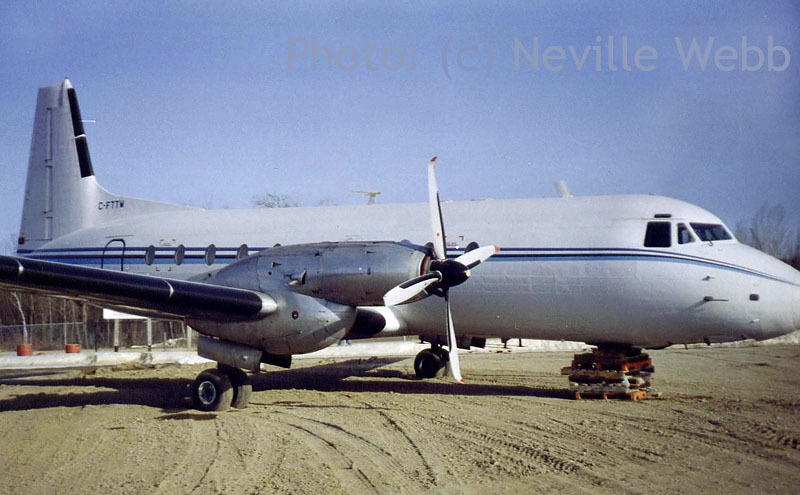 Canso A at North Atlantic Aviation Museum (@Gander; no date specified). subsequently donated donated to the museum. Its history is described further up this page. Note the Bristol Freighter in the background! 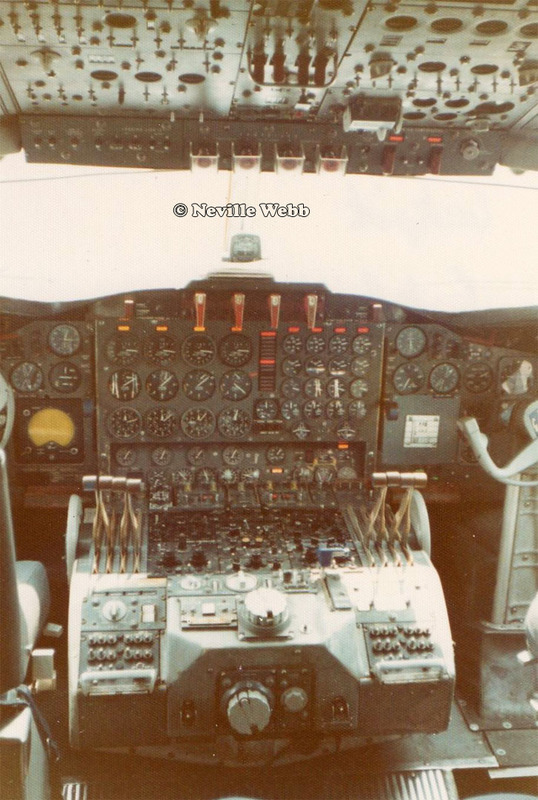 Neville wrote: "I took this photograph at Lasham airfield in 1966. This aircraft has an interesting history! 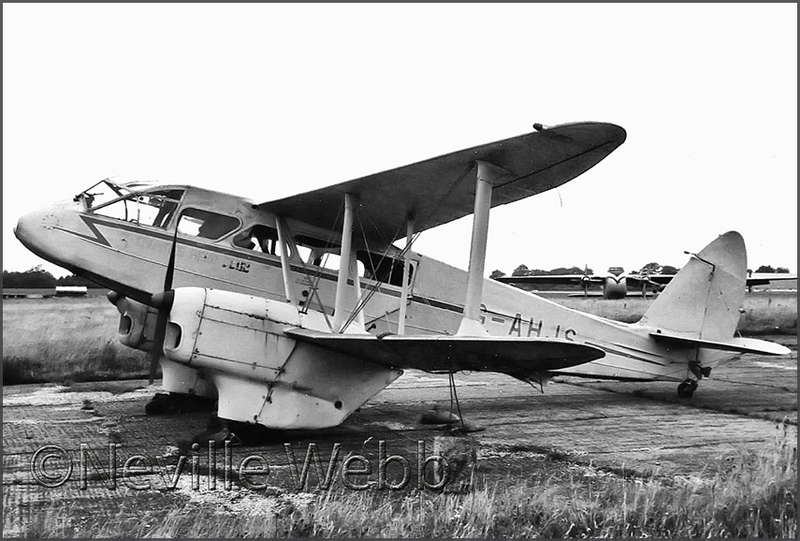 One aviation website reports the aircraft being abandoned at Blackbushe airfield, from 1966 till 1973. However, at one time 'JS evidently flew to Lasham! Note the '3 Counties Aero Club' lettering barely visible on fuselage. Besides that Bristol Freighter there was an Avro York nearby. That was an interesting afternoon at Lasham, a time when one could just drive into and around a large airfield! 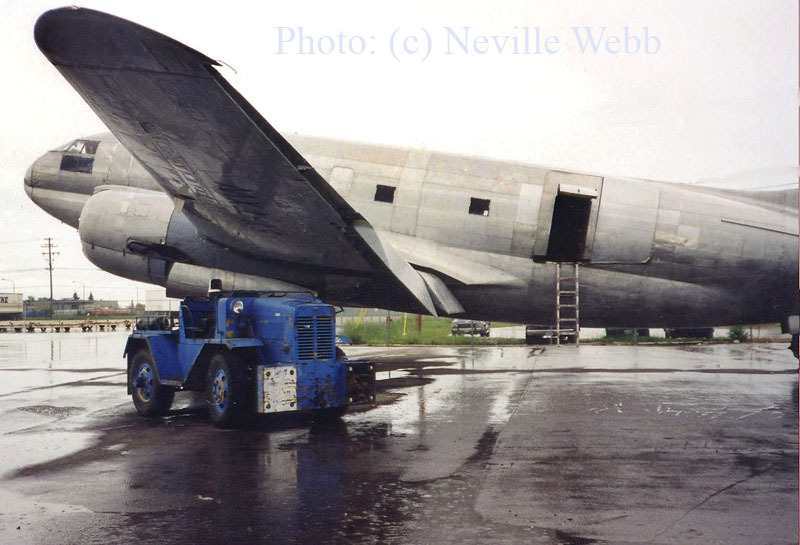 I did take a few more pictures (of a DC-7B), but I spent more time at a nearby aircraft scrap area (now gone,btw)"
started the engines and ATAB taxied out for take off!" Neville:"The aircraft is not in standard DAN AIR finish, so must have been just bought."